I hate leaving my flowerbeds, kitchen garden and greenhouse at this time of year. Not only do I miss out on the wonder of seeing the garden change by the day, but everything's so tiny and fragile, the slightest drought/drench/heatwave/chill can really mess with my plans. Luckily though everything survived, thanks to a few milder days and a very helpful friend. The south-facing flowerbed was completely transformed into a vibrant jungle of tulips & perennials. needed dose of sunshine after almost two weeks of shady living. Growth in the kitchen garden wasn't quite as overwhelming, probably due to the warm, dry weather. But it was all in need of a jolly good drink! My lettuce babies have survived the slugs, but are looking a little parched! The peas are looking nice and solid. onions AND marigolds around them. Potatoes! 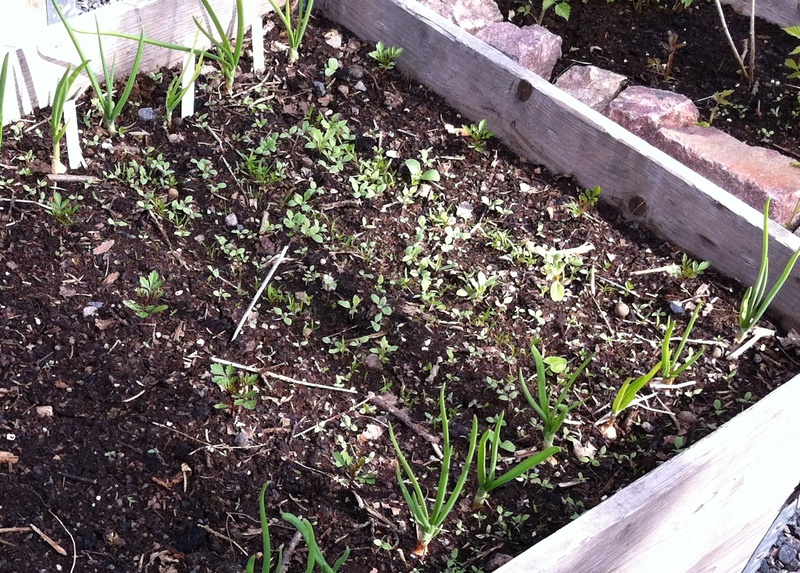 :D But still no sign of life in the asparagus bed. I thought they would show first...? There was a problem with the watering system in the greenhouse, but thanks to our friend Johan's determination (and stupidity - he stuck the v. v. grimy hose in his mouth to get the flow going again... bläääää!) it's all looking fabulous. Beautiful blue (?) parrot tulips living in harmony with Jalastar capsicum annums. going on, so they'll have to wait just a little longer. Chicken salad (with shop-bought toms, of course). På dit første billede kan jeg se, at du har en smuk have.Tak for kigget. What a beautiful spring garden. Your tulips are lovely. I love your greenhouse. Is the picture that seems to have white tulips on the inside or outside of the greenhouse? I have decided that this year I will not be gone overnight at least until late Oct, if then. At the moment watering is taking all my time!